There’s a classic Calvin and Hobbes cartoon strip that’s always stuck with me. To borrow Calvin’s question: “It’s 6pm on a Thursday evening. Do you know where your customer is?” This isn’t some theoretical query – the likely location of the recipient should inform your messaging strategy. The context in which someone receives a message from a business has a huge bearing on how successful that message will be. First thing in the morning, a message you sent overnight is most likely to be read on a tablet or smartphone. Most people will do a quick triage of email and other alerts, archiving a lot of mails that are irrelevant, seeing if there’s anything urgent, and leaving everything else until they get to work. That’s assuming your message even gets a look in between Twitter, Facebook, the news, not to mention “real-world” distractions such as making coffee, feeding the kids, or exercising the dog. At the office – whether that’s at home or somewhere we commute to – a bigger screen comes into play. 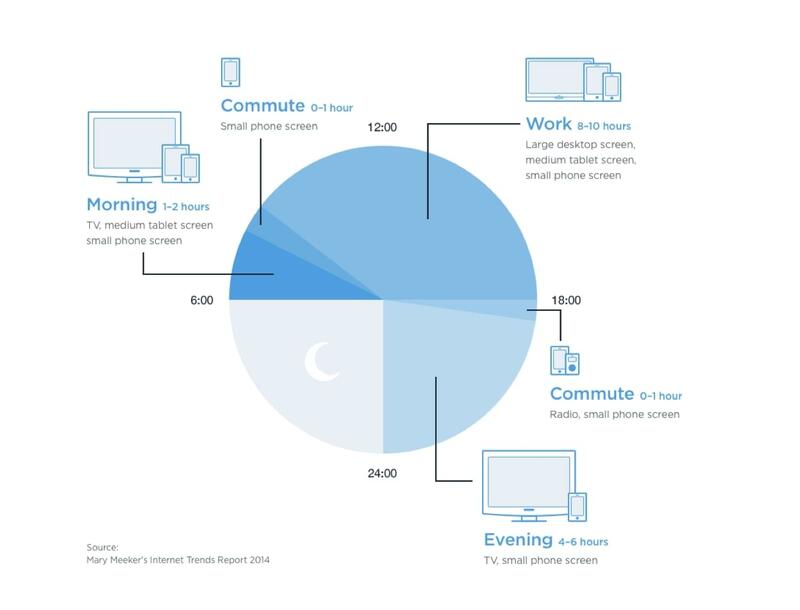 As the screen size increases, so does our attention and bandwidth to engage with messages. Everyone has a particular set of apps and services they check at the start of the working day to get a fix on what needs to be done that day. Check the calendar for meetings, review email, open Slack, then Twitter, then Slack, then back to email again, all just to build up a mental model of where things are in work. Then it’s down to real work. There’s a good opportunity to get your message read and acted on if you’re near the top of the pile (i.e. you’ve just sent it) and your message stands out from the noise (i.e. you’ve a compelling message and a strong subject line). As the day progresses, the most common pattern for dealing with messages, particularly email, is to check sporadically with an occasional triage between tasks or meetings. No matter how important the meeting, people get bored or distracted. The phone buzzes on the table and they can’t resist a quick glance at the push notification. They’ve no time to read the full message, never mind process or reply to it, so chances are high it will get ignored or missed. That’s why polite reminders sent at a different time of day to the original message can be so effective. If someone has just finished a run or bike ride, is chilling with their feet up as they upload their route to Facebook from their smartphone, and is generally feeling happy with their achievement, it’s the perfect time for Strava, the popular fitness tracking app, to ask them to upgrade to a pro account. But it’s far from the optimal time for a project management tool to ask if they’d like to try out a new charting feature. No one wants to receive a push notification telling them they face account suspension if they don’t urgently update their billing information, at 7pm on a Saturday night. Best case a badly timed message like that will just be ignored and forgotten. Worst case it may even make the recipient anxious and resentful towards the sender. As a product owner you have to ask yourself what are the chances a customer will take the action you want if you contact them on a weekend evening? If they need to take their company credit card out and fill all its details in on a mobile device (maybe on a site that’s not even mobile optimised) the chances are pretty low. But if you’re launching a new app that lets concert goers find last minute tickets in their city, well then Saturday night is prime time! At some points during the day we are totally in work-mode, but other times we are tuned-out and trying to relax. Parts of the day are quiet and we are able to focus, while we also go through periods where we are juggling competing demands and trying to filter out distractions. Not only should you consider the state of mind of the recipient but the capabilities of the devices that it’s likely to be received on. If you’re using Intercom to send your messages there’s three main ways you can schedule messages to land the optimum time. Auto-messages to customers or website visitors can be triggered to send during your working hours, so that you’ll be around to deal with any answers. Email and push messages can also be sent during a specific delivery window. And for any message type you can specify a particular date and time for it to start sending. You can’t hand deliver each message, tapping the recipient on the shoulder at the optimum moment, but you should consider the likely scenarios into which you are sending your message and how that will impact its effectiveness. If you’d like to learn more about sending the right message, to the right people, at the right time and right place, check out our book Intercom on Customer Engagement.